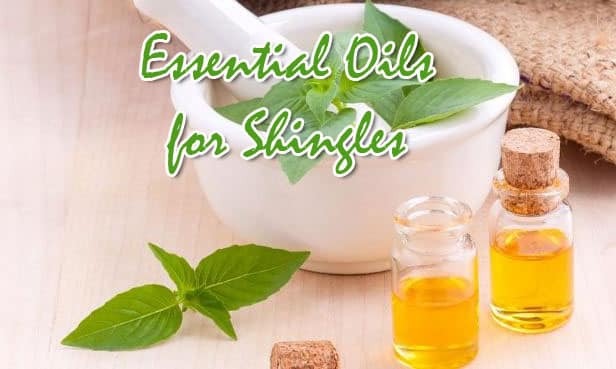 Essential Oils For Shingles – It is a painful condition that derives from the chickenpox virus you were infected with as a child. This virus, known as varicella zoster stays dormant within the nerve cells. Anxiety, stress and poor functioning of the immune system most commonly reactivates the virus when one gets older where it reemerges as shingles. Each episode of shingles can last anywhere from 2 to 4 weeks. It causes a host of undesirable and painful symptoms to occur. It is primarily marked by rashes and blisters on the skin around the torso of the body. The rashes and the blisters can also appear on the legs, arms, neck eyes and face. Tingling and pain in the nerves also occurs in these areas. Along with medication that has been prescribed to you by a doctor, their are natural remedies that can supplement this treatment. Essential oils, derived from natural sources can provide topical relief for the pain and itching due to their plethora of healing properties. To use essential oils for shingles, mix about 7 to 8 drops of the oil with a tablespoon of olive oil. Olive oil is a good carrier oil in that it easily coats the skin, it is mild, soothing and has omega 3 fatty acids that help the cells within the skin to heal. Coconut oil is another great carrier that can be used. The combination can then be gently massaged into the skin for better absorption. Furthermore, it’s recommended that you buy pure essential oils from a reputable brand because many brands on the market sell oils that are diluted or less potent, creating subpar results. Lavender oil is one of the most soothing essential oils. Topically, it is known to reduce pain and inflammation which will help you to cope with the effects of shingles on your skin. Aromatically, it is known for its relaxing and calming effect, and it also helps to reduce stress which can help to free up your immune system to fight the virus. Lavender also improves your ability to sleep and is effective in reducing restlessness, which can be an issue when your body is in pain or itchy. Lemon oil is useful for cleaning the skin. It removes dirt oil, and has antiseptic properties that destroys bacteria and viruses. It also helps to reduce inflammation caused by damage to the cells in the skin. This oil is photosensitive, however, so do not expose your skin to direct sunlight after application. Peppermint Oil is extracted from peppermint leaves and concentrated. It is used in aromatherapy to clear the mind soothe the sinuses and helps reduce anxiety and stress. When used topically it stops itching and also reduces inflammation, allowing the skin to heal. Germanium oil has been used by the ancient Egyptians to treat common conditions of the skin such as eczema and dermatitis. It is an antiseptic and rids the body by killing microorganisms. It also helps to relieve pain and absorbs very quickly. The tea tree is a native plant in Australia. It is antiviral and helps to clear bacteria and viruses from the skin and the body. You can find relief for many of the symptoms of shingles with essential oils. The oils don’t help to cure the virus but they help cope with many of the associated negatives, and their aromatic uses such as stress relief and sedation, can help to speed up your recovery time.